Investors continue to punish the shares for the company's stubbornly weak sales growth trends. 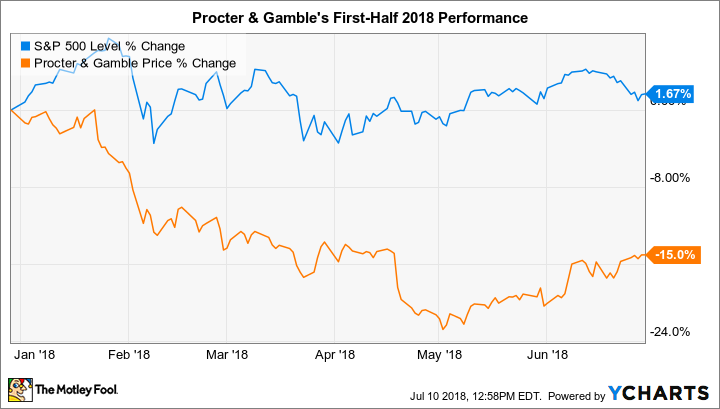 Returns for Procter & Gamble (NYSE:PG) shareholders have underperformed the market through the first six months of 2018. The stock fell 15% in that period as the S&P 500 gained 2%, according to data provided by S&P Global Market Intelligence. The slump has contributed to a rough run for P&G investors, who've seen their shares stay flat over the past five years compared to a 69% spike in the broader market. P&G's big problem has been sluggish sales growth. Its revenue ticked up by just 1% in the most recent quarter to mark a slowdown from the prior quarter's disappointing 2% increase. In explaining the results, CEO David Taylor cited pricing pressures across the consumer staples industry. "The ecosystems in which we operate around the world," Taylor said, "are being disrupted and transformed." The good news: Procter & Gamble's costs are still trending lower. It remains a fantastically efficient business that generates tons of free cash flow and market-leading profitability, too. These characteristics support ample cash returns to shareholders in the form of dividends and share buybacks. Yet the multiyear slump in the stock isn't likely to end until the owner of the Pampers and Gillette franchises can use those brands to return to at least modest market-share growth.